The T3 All Season Trekker Features 3 separate layers of fibers that work together for comfort, support, and moisture management. A layer of TENCEL provides a layer that is soft to the touch and comfortable against the skin. It is a fully biodegradable fiber that is made from trees from sustainable farms. The COOLMAX layer works to move perspiration away from the body, and through the fabric, where it can evaporate quickly, allowing the wearer to feel cooler and more comfortable. Lastly, a layer of Nylon and Ea. 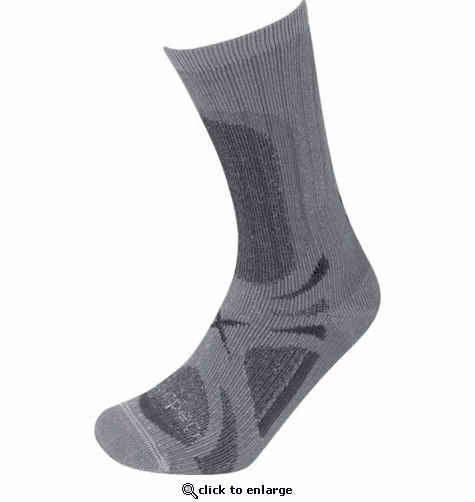 LYCRA adds durability and ensure these socks stay up in your running shoes without slipping down to your toes. 10% Ea. Lycra all throughout the sock means no slipping or bunching up. These socks will stay up all day long. Lorpen began as a small manufacturer of technical socks in the Basque region of Spain in the early 1980’s. Our founders were looking to make innovative and functional socks for walking and hiking enthusiasts. We are now a company with manufacturing facilities located on two continents and we sell our socks in more than 60 countries worldwide.